"I think it is a situation where legislators who didn’t know anything about insurance are making rules that won’t work," said a Kansas lawmaker. What the state lawmakers didn’t expect, perhaps, was the response from EMC Insurance Companies, which covers most Kansas school districts. EMC immediately sent a letter to its agents in response to the prospect that districts could legally allow teachers to be armed on their campuses. “We are making this underwriting decision simply to protect the financial security of our company,” it concluded. But the desire to arm teachers remains. After the shooting in Parkland, Florida, killed 17 at Marjory Stoneman Douglas High School on Feb. 14, lawmakers in seven states quickly introduced bills that would legalize the arming of teachers. Yet of those, so far only Florida Gov. Rick Scott, a Republican, has signed a bill that permits school districts to arm trained school workers with handguns. The shooting also renewed the issue in Kansas, where the statehouse is debating a proposal that would make schools liable if they didn't arm teachers. The proposed legislation would make it so that insurance companies could not pull coverage, as some Kansas lawmakers hope to overcome the insurance hurdle that has stymied many districts across the country from pursuing the policy. I think it is a situation where legislators who didn’t know anything about insurance are making rules that won’t work. And there are examples of schools taking on rising insurance premiums because of similar laws. In 2013, the Oregon School Board Association, which provides insurance coverage for most of the state’s schools, announced a new pricing structure for K-12 schools that decided to use armed personnel on their campuses. It costs schools an additional $1,500 for each armed individual who has military training or equivalent experience, is a member of a city or county law enforcement agency and is certified by the Department of Public Safety Standards. For those with just the department’s certification, coverage is $2,500 more per person. Will arming teachers be possible in Florida? The board of the Lake County School District in Florida met last week to discuss the results of a survey that asked teachers how they felt about being armed. Fifty-three percent of the staff supported the idea while 47 percent were opposed, according to school district chairwoman Stephanie Luke. The board has spoken to the county sheriff and debated the issue in public hearings that lasted more than five hours, with the speakers about evenly split on the issue. Next, they plan to organize a student committee to represent the more than 42,000 members of its student body. "Nobody wants to make the wrong decision," Luke said. "If we decide that we want to have guns on campus and something tragic does happen, then you feel like you made the wrong decision. But if someone was stopped who was trying to harm your children then it’s the right one." But all of those conversations may be moot depending on what their insurance company tells them. “It’s a discussion we’re having with our lawyer and our insurance company,” Luke said, emphasizing that those talks are only at the early stages, as the board does not want to appear that it has come to any conclusions on a new policy. “But it would be more liability,” she conceded. School safety and insurance experts agree that adding a firearm to a classroom only increases the risk of gun violence — whether intentional or otherwise. And two incidents that occurred last month would suggest Brownyard might have a point. In early March, a Georgia teacher was arrested after he fired a gun at a high school and barricaded himself in a classroom for nearly an hour. Two weeks later, a California high school teacher injured three students when he fired a gun inside a classroom during a firearm safety course. Did the new spending bill really end the hold on gun violence research? Maybe not. Kenneth S. Trump (no relation to President Donald Trump) heads the National School Safety and Security Services and is a frequent expert witness in litigation focused on school security. The common theme, he said, is typically human error. And adding a gun to that equation could lead to a troubling outcome. “While a lot of these approaches from arming teachers and having kids engage heavily armed gunman to many other knee jerk unproven practices meet emotional security needs, the devil is always in the details of implementation," Trump said, "and many of these approaches bring great risk or unintended consequences." 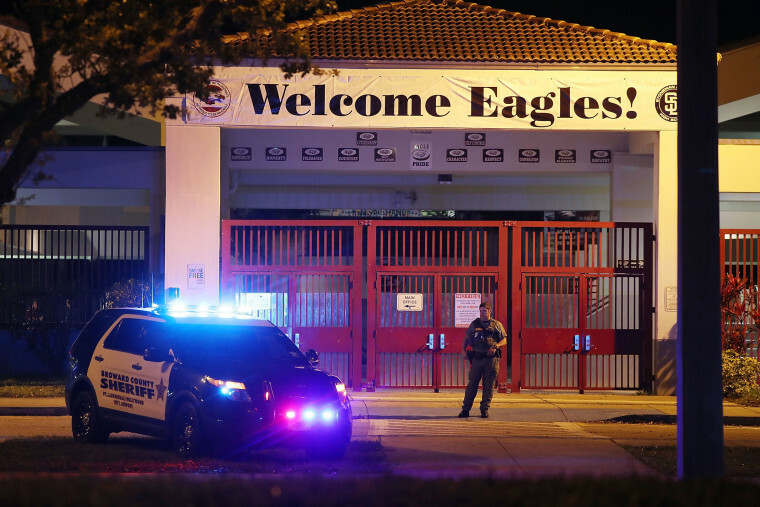 Many smaller school districts across the country, however, say that arming their staff is the best way to insure safety at schools that don’t have nearby law enforcement officers. Callisburg Independent School District, which is about 90 miles north of Dallas, successfully implemented a so-called guardian program in their schools about four years ago. Notably, though, the entire district is only responsible for slightly more than 1,100 students during the 2016-17 school year, according to The Texas Tribune. The district’s desire to implement the program also grew after Sandy Hook, said the superintendent, Steve Clugston. And while Clugston said that he had to discuss it with their insurance company, the school district’s premiums did not change — likely because they don’t have a large police presence close by. But Clugston said that arming teachers may not be realistic for every school district.